Tanner De Witt is pleased to support Asia’s biggest sporting event, Hong Kong’s annual Rugby Sevens Tournament later this month. Last night we caught up with Tanner De Witt solicitor and professional rugby player Rowan Varty at the Official Ticket Collection event at Isola in IFC Mall who told us about his lifelong commitment to this popular event. 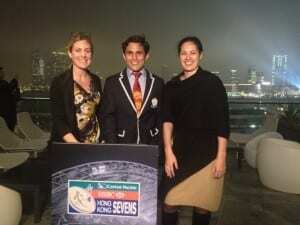 “This will be my 30th Sevens event – I have been going since I was a few months old and I have been every year since,” says Varty. Rowan describes the Sevens as the highlight of his year and names Andy Chambers, Isi Tu’ivai and Ricky Cheuk as his idols. Expectations for the Hong Kong team are high this year but favourites Tonga are expected to put up a good fight. Some are even pinning hopes on South Africa achieving their first ever Sevens win. Come and say hi to the Tanner De Witt team on the executive level over the Sevens weekend. We will be there supporting Rowan and the rest of the Hong Kong team. Rowan supports partners Kim Boreham and Russell Bennett in the Employment practice group of Tanner De Witt. His profile can be found here.